Looking for a fun crazy Christmas idea? Look no further! We have put together the craziest work shop ever! 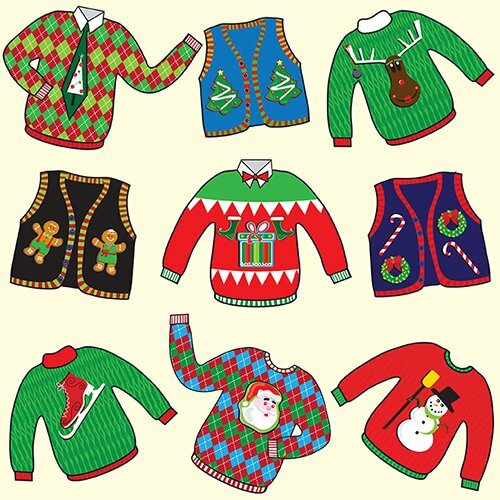 Design Your Own Ugly Christmas Sweater. We will teach you how and where to start, to create an Ugly Christmas placement print and how to set up files for garment placement print production. Bring your creativity, sketches, images that you would like to use in the design, create your own Ugly Christmas Sweater on time for your holidays to wear! And don’t worry, you can design a pretty one too. Full day workshop style class will provide you with knowledge on digital textile design for placement printing of garments. How to create and design your own placement prints. DATE: 29th October Saturday, full day workshop from 9.30 am till 4.30 pm. DURATION: 7 hours including break. Coffee, tea and snacks will be provided. After the workshop you will have the option to have your design digitally printed and made into a Ugly Christmas Sweater, at an additional cost. Camera, it can be your phone if it has a good camera. TEACHER: This course is curated by Liz Godkin. Liz worked at Digital Fabrics at the beginning of our journey and has amazing and vast knowledge in digital textile design and printing. Read about Liz here. Please don’t be late, class will start on time. Sorry, we don’t have disabled access. We look forward to meeting you and seeing your creative ideas! Payment must be made online only. Due to limited spaces, all workshops bookings are final and cancellations will result in forfeit of payment. Bookings are strictly NON transferable to other class dates. Group bookings are welcome! Give us a call to organise a corporate Christmas fun class to get your Christmas partywear sorted.